Lewiston Mayor Robert Macdonald speaks with WGME-TV on Tuesday about anti-immigrant comments he made in a BBC documentary. 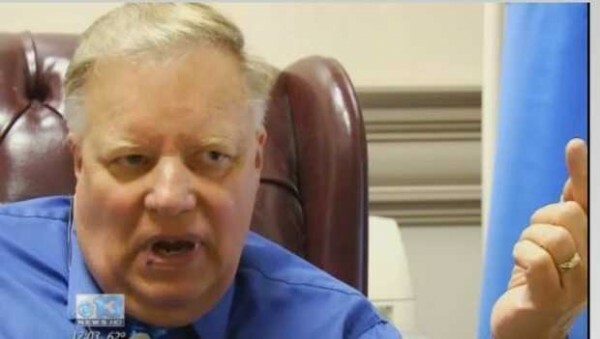 LEWISTON, Maine — Angered by comments Lewiston Mayor Robert Macdonald made to state and international television reporters, two Maine-based organizations are calling for him to resign. The Lewiston office of the Maine People’s Alliance is gathering signatures and online support for a petition it plans to present to City Hall later this week. Gen Lysen, the lead organizer for the MPA’s Lewiston-based Androscoggin County chapter, said the group collected hundreds of signatures from Lewiston residents and at least 1,000 had signed an online petition asking Macdonald to step down. Meanwhile, the African Diaspora Institute based in Portland also called for Macdonald’s resignation during a Monday evening press conference outside Lewiston City Hall. The petition would not have any legal standing and the city’s charter does not contain any provision for recalling a mayor. Macdonald drew sharp criticism last week for comments he made, first to the British Broadcasting Corp. in a documentary aired in September and then to WGME television in Portland when he attempted to clarify those comments. Messages left for Macdonald at his office and home were not returned Monday evening. Macdonald has said his comments, which seemed to be aimed at Lewiston’s growing population of Somali immigrants, have been blown out of proportion, but others have said the comments are just the latest in a long series of divisive things the mayor has either said or written. Lysen said that pattern includes portions of columns Macdonald has published in the Twin City TIMES, a free newspaper that is circulated once a week in the community. Macdonald has written a weekly column, titled “Enough is Enough” since he first took office in January 2012. Macdonald’s column did not appear in the latest issue of the newspaper, which came out last Thursday. Lysen said Maine People’s Alliance members have complained to the publisher about Macdonald’s column but have had no response. On Monday, Lysen called Macdonald’s statements and writing “hate speech, racist and frankly bigoted.” She also said that members of the Somali community were concerned his words would encourage others and even incite violence in the community. “Folks in the community are worried about what may happen and are feeling like that because we have one of our elected officials encouraging those feelings and those thoughts,” Lysen said. She said many in the Somali community came to Lewiston and Maine because it’s a safe and peaceful place. “And here they are being faced with words that could incite hate and violence,” she said. On Monday, Laurie Steele, the publisher of Twin City TIMES, said in an email message to the Sun Journal that Macdonald did submit a column for the latest edition but it was not published. She said the newspaper was not in the habit of censoring opinion columns or letters to the editor. Steele said her newspaper would continue to monitor the situation and would decide whether to continue Macdonald’s column. Meanwhile, Mohammed Dini, African Diaspora Institute’s executive director, said at Monday’s press conference that it was important for Somali immigrants, including those who are American citizens or even born in Maine, to say no to hate speech. “We don’t want anyone else to defend us, we are actually Mainers and we can speak for ourselves and tell people how we feel,” Dini said. He said the Macdonald’s statements regarding culture were completely counter to the view of an American melting pot that most Maine people and most immigrants believe in. He also said Macdonald’s latest statement was just one more in a long list of things he has said or written about immigrants in Lewiston.